Last weekend I found two of these canvases taped together with packing tape, and marked "Free" at a garage sale. The canvases had been painted white and had a dark red arc painted on each of them. I asked the homeowner, "Are these canvases free?". She said, "Yes, you can repaint them." 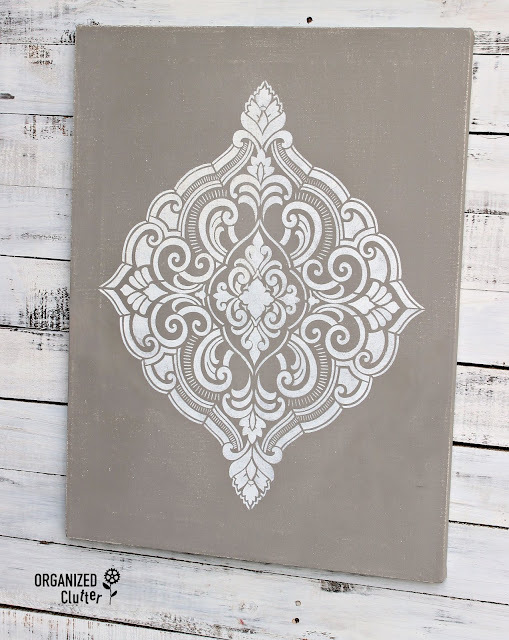 It certainly has occurred to me to paint and stencil on canvases before, but when I look at the price of a bigger canvas at the craft shop, I gave up on the thought. But free, free is good. If my idea doesn't work out, I can throw it out! 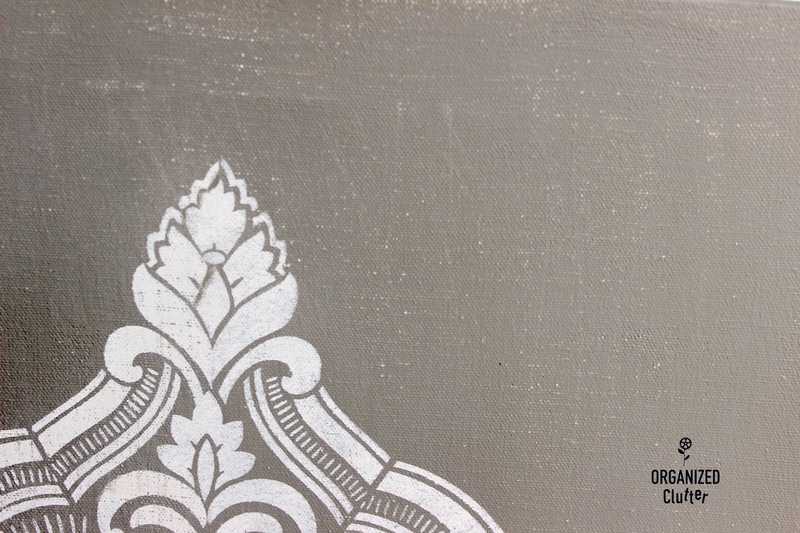 I brushed on two coats of Annie Sloan Chalk Paint in French Linen. I love the color of French Linen. I painted my bathroom vanity with French Linen. I just love scroll-y stencils too. 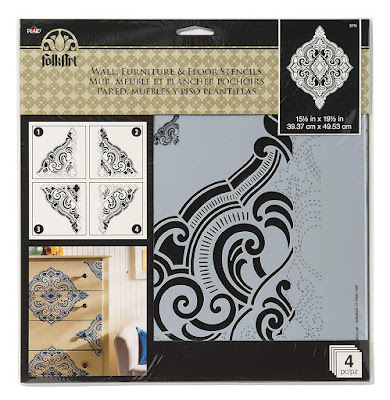 Mandalas and damask. They remind me of lace and doilies. 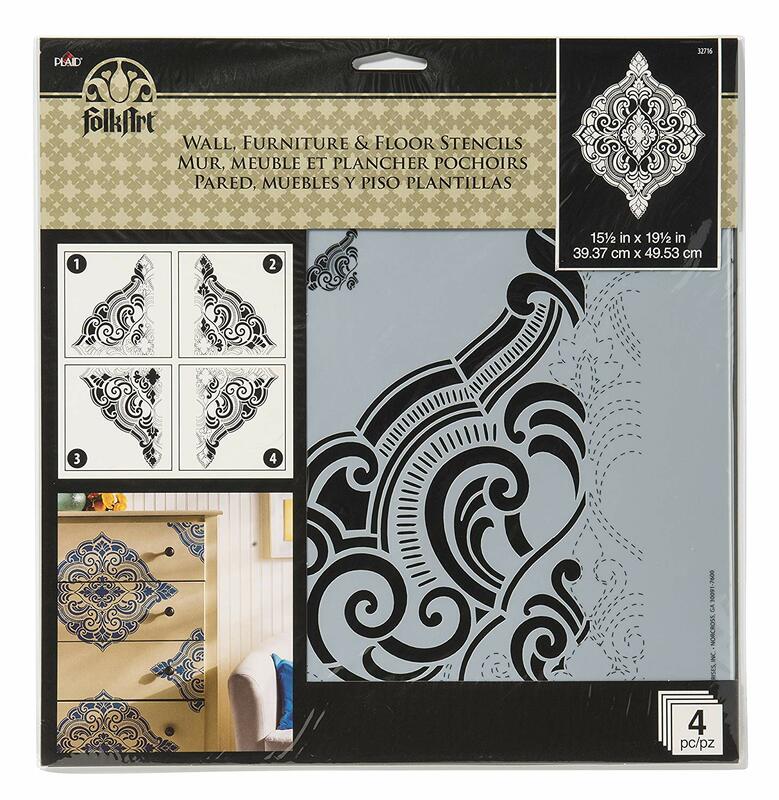 I pulled out a FolkArt Painting Stencil, Ornamental Damask which is a four part stencil. I got mine at a Michael's Store but it is available at Amazon as well. Measure, measure, measure. You have heard of measure twice and cut once. Measure your stencils to make sure you have them centered. Then tape it in place with blue painter's tape. 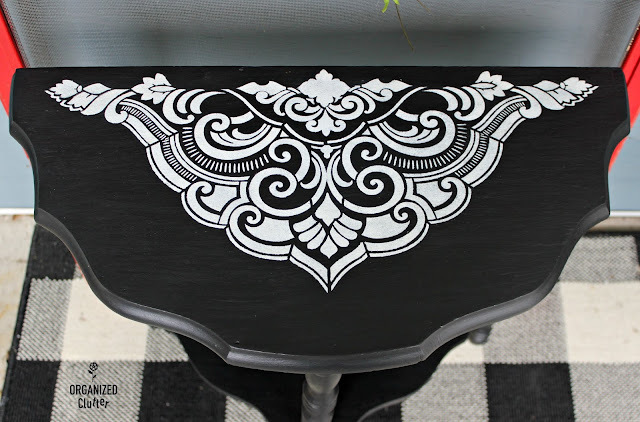 The best part about stenciling is that you CAN REPAINT and RE-STENCIL, if you make a mistake, and small touch ups work as well. I fold a scrap of sandpaper into fourths, and use the inside folded corner to sand small areas of paint bleed around my stenciling. If your brush is pretty dry you won't have any bleed under the stencil. But, occasionally I am hurrying and get some bleed around my design. Here I am on stencil four already! 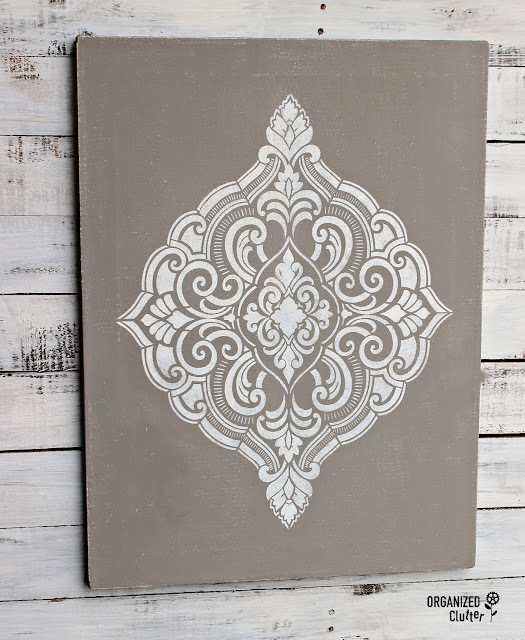 By the way, I used Ceramcoat Acrylic Paint in White to stencil my damask design. I sanded my canvas with 100 grit sandpaper. I liked the linen look it gave to my canvas. And it wasn't so perfect. It looked a little aged. I added a sawtooth to the back for hanging. I also sealed my paint and stencils with Krylon Aerosol Sealer in Satin Finish . Just a tip. If you find a painted canvas that you plan to re-paint. Sand first, to make sure all of the paints (if more than one) are the same thickness. It works better! If you thought my stencil looked familiar, I just used on this demilune table upcycle! Details here. Great idea using canvas. Nice results with stencils, looks perfect.